Mr. Dedes is founding partner of Dedes & Associates Law Firm. He is appellate attorney appointed at Athens Bar Association, High Court of Jurisdiction and Council of State; he has great experience in practicing business and investment law in Greek and the international jurisdiction. 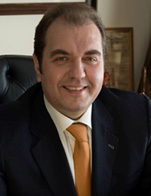 He is president of the Hellenic Society of International Law and International Relations, member of the Greek-Russian Chamber of Commerce, vice-president of the Greek- Kazakh Chamber of Commerce and Vice-president and founding member of the Greek-Eurasian Business Council. He has served as a senior Legal Counsel at the Ministry of Development, Competitiveness, Infrastructure, Transport and Networks. Moreover, during his professional experience he served as a Legal Counselor to the Honorary Consulate of the Russian Federation in Corfu and the Ionian islands and to the UNESCO Group of Piraeus and Islands. He holds a Bachelor's Degree in Law from Bologna University, an LLM and a Master's Degree in Civil Law from Macerata University in Italy. He has also studied journalism in Urbino University, Italy. Foreign Languages: English, French, Italian, Spanish, Russian.